Saturday 19th July. 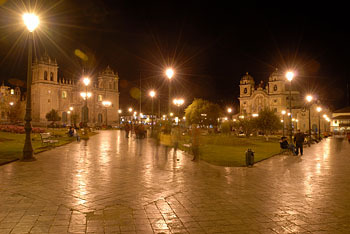 We flew into Lima from New York, arriving at around 22:30. We travelled into town for the night. 20th July. An early start (03:00!) for a 05:30 flight to Arequipa. 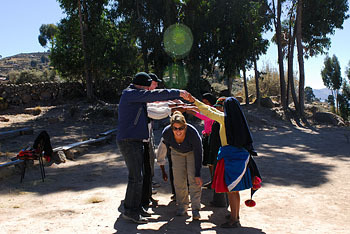 We met our first driver and guide and started out on the very long minibus ride to Chivay. 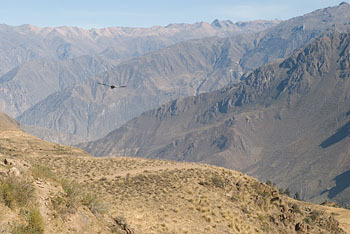 During our journey we had some great views of the Peruvian Andes. 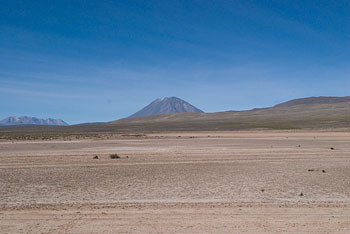 El Misti is a dormant volcano rising to an altitude of 5,822m. 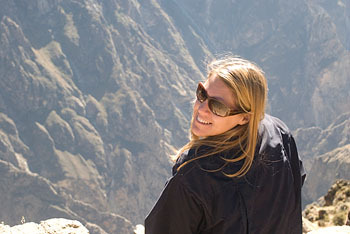 Throughout our time in Peru the locals hailed Coca Tea as a miracle cure for just about everything – Tammay enjoys a cup. 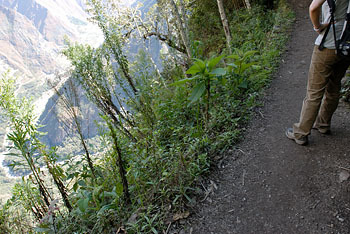 As we continued on our journey and gained altitude we left all the larger plant life behind us. 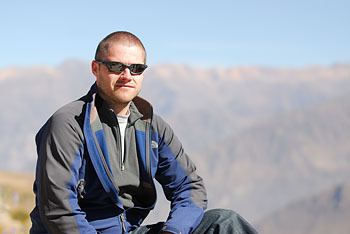 We passed through a summit of 4910m (16,110ft) at Patapampa and the Mirador Los Andes. 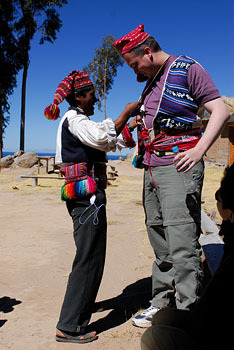 We all felt the effects of altitude sickness. 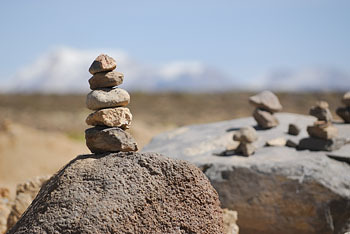 These little towers had been built at many of the rest stops. 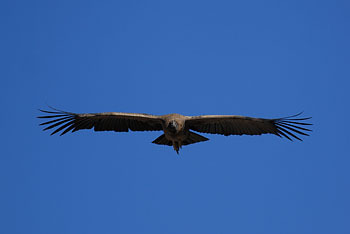 We finally arrive in Chivay and we're in time for a buffet lunch. 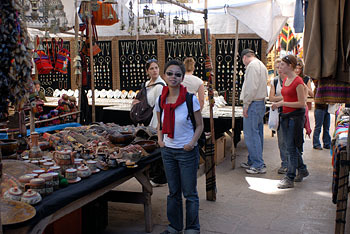 After an hour nap we spent time wandering around the market in Chivay (Tammay bought an alpaca scarf). We had a buffet dinner with traditional dancing at the hotel. 21st July. Another early start, although not quite so bad today. 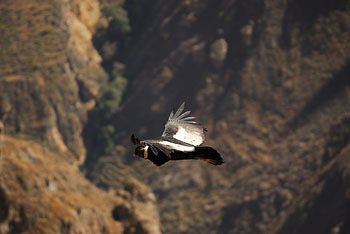 Up at 05:30 for the trip to Colca Canyon. 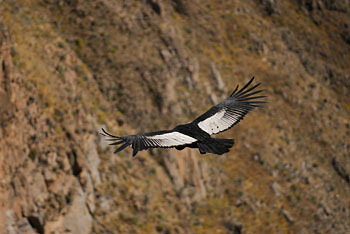 From the viewing point on the side of the canyon "Santuario Del Condor" we were able to see condors, eagles & buzzards flying on the thermals. 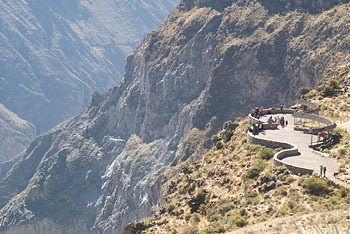 A slightly lower view point at Santuario Del Condor. 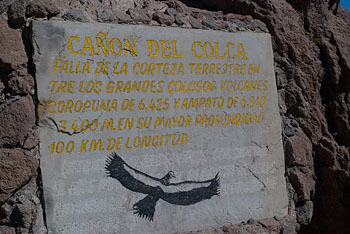 With a maximum depth of more than 1000m Colca Canyon is said to be the deepest canyon in the world. 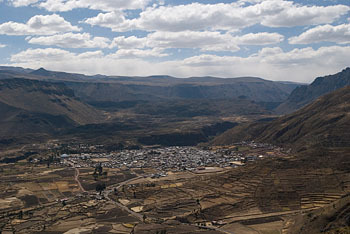 We stopped a number of times on the way to and from Santuario Del Condor and saw examples of Inca and pre-Inca terracing and some small communities. 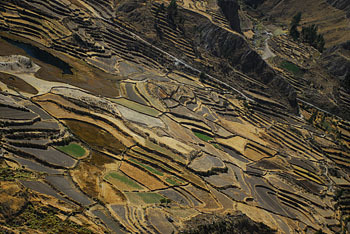 It was amazing to see just how much of the landscape the Incas had terraced. 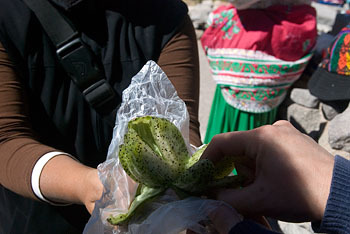 On the return journey we stopped to try two different types of cactus fruit. 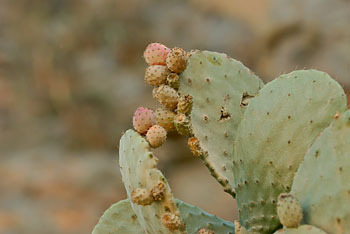 The first was very similar to a kiwi (cactus fruit) while the second was more like papaya/melon (prickly pear). 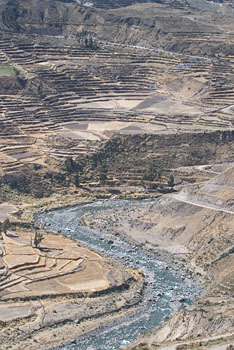 More terracing in the Colca Valley. 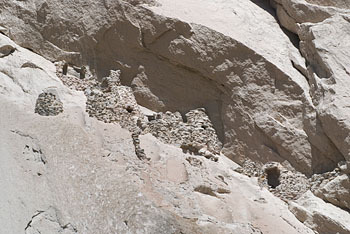 Old burial sites used by the local people. 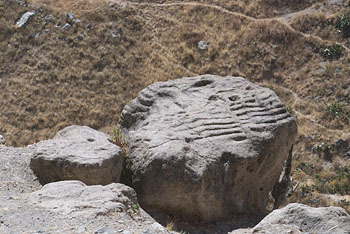 This large rock had been carved into the shape of the hillside in front of us. 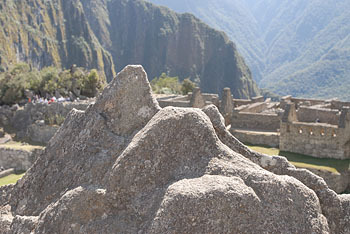 By pouring water onto the top of the rock it would be possible to see how the irrigation system would work. 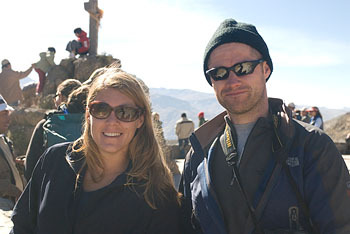 On the way back to Chivay we stopped in the small town of Maca to see its church. While we were in Maca Jason and Kelly considered trading in their cat. 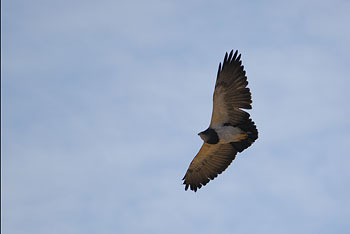 We had lunch at the hotel and spent the afternoon at a local sulphurous thermal spa in La Calera. Dinner was once again a buffet at the hotel. 22nd July. 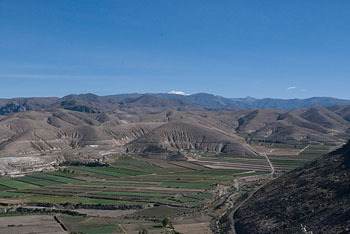 We left our hotel at 07:00 and started the hideously long drive to Puno, once again passing Misti Volcano. 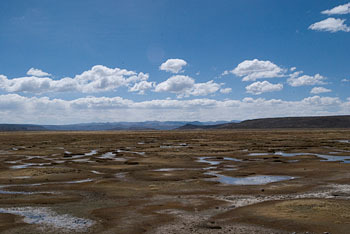 We made a brief stop at this lake which had a small flock of flamingos (I couldn't see them!). 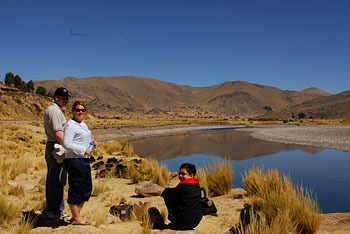 We stopped along the way to eat a picnic beside a river – I think it was the Green Lemon River. 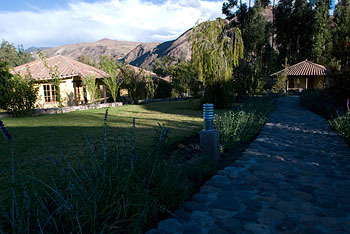 We arrived at the Libertador Hotel and were glad not to be staying at the Eco Inn dorn the road. 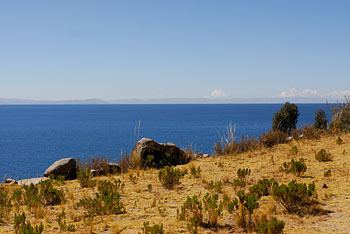 The hotel looked fantastic from the road on the way into town and this was the view of Lake Titicaca that we had from our room. We enjoyed a cool drink in the hotel lounge and a couple of hours in the spa. 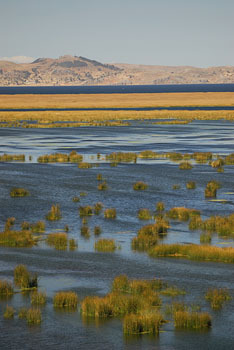 Lake Titicaca is home to the reed islands. 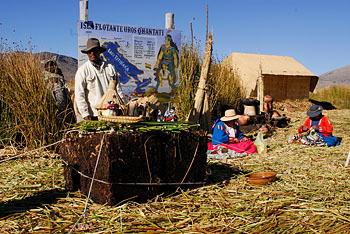 There are about 30 natural islands on Lake Titicaca and currently a further 46 reed islands, however this number is increasing as the population (and possibly tourism) grows. 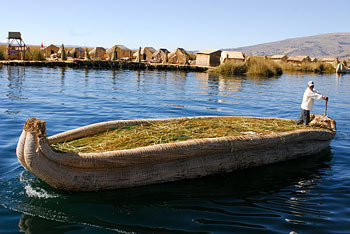 With an altitude of 3800m Lake Titicaca is the highest navigable lake in the world. 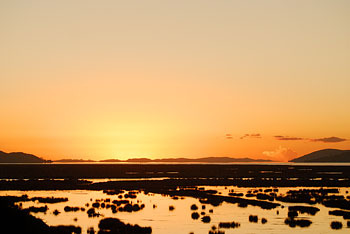 We watched the sun set over Lake Titicaca from the comfort of our room and ate dinner in the hotel restaurant. 23rd July. 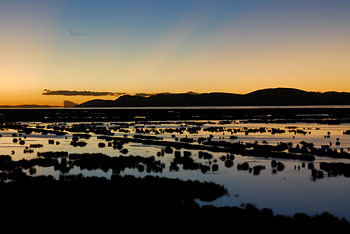 Sunrise over Lake Titicaca. 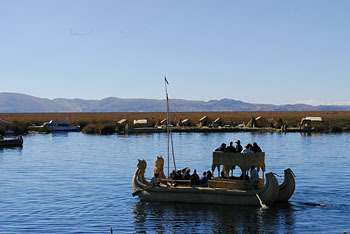 We left the hotel at 07:30 for a full day tour of Lake Titicaca and the reed islands. We were pleasantly surprised to find a very comfortable minibus waiting to drive us the 5mins to meet our boat – if only we had had this for the last couple of days! 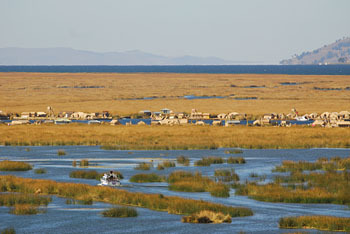 We took the short journey to the reed islands – "Islas Flotantes Uros". 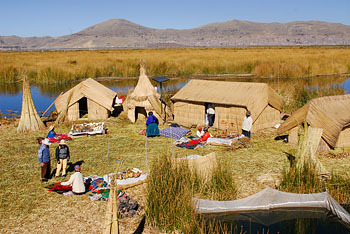 We were taken to Uros Qhantati which was home to 5 families. 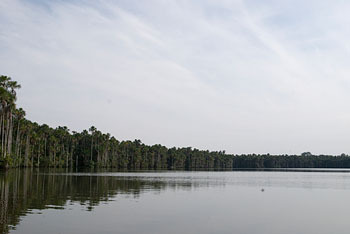 We were told about their way of life, the construction of a reed island and invited to see inside their homes. 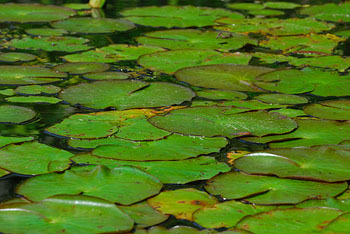 The 'floor' of the island is simply made up of large quantities of reeds laid flat. We bought a blanket from one of the ladies, however I think it was more likely mass produced in Taiwan rather than being hand crafted on the island. 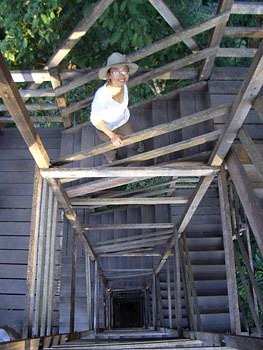 Most of the islands had little viewing platforms... We climbed up and surveyed the area. 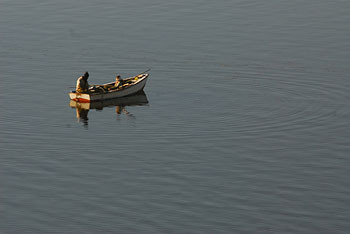 We were also able to take a short ride in what looked like a more traditional boat... However we were told how it had been built with 2000 2litre plastic Coca Cola bottles. 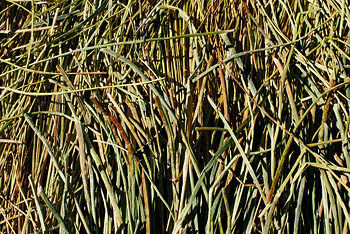 Basically everything on the islands had been made of reeds! 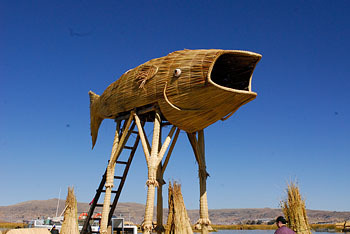 One of the islands had built this huge 'fish' viewing platform. 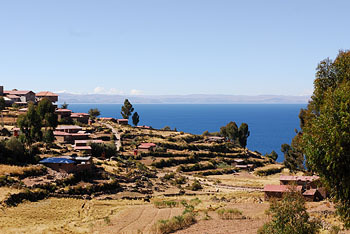 We travelled on to Taquile Island, the 4th largest island on the lake. 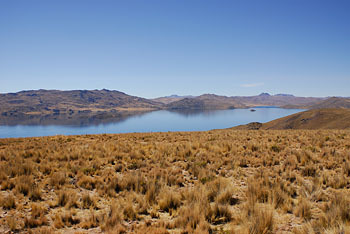 Lake Titicaca is within the borders of both Peru and Bolivia. 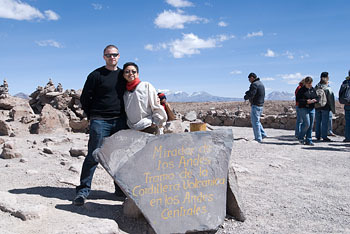 On a clear day you can see Bolivia in the distance. 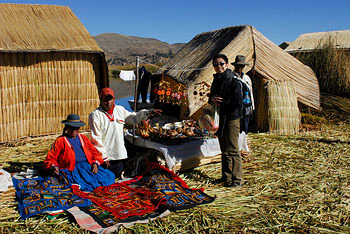 Our boat travelled on to Soto Island in Bolivian waters and collected us on the way back. 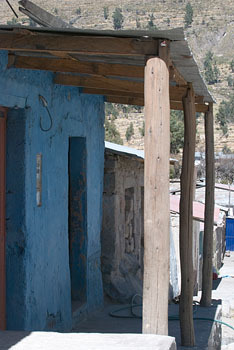 We walked to the home of a local family and got to hear about their way of life. 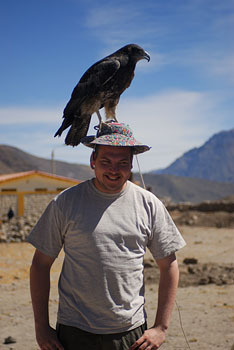 We were told that single men and women wear different hats and clothes to married men and women. We ate a really enjoyable lunch. We couldn't get enough of the bread (which tasted more like deep fried batter pieces!). 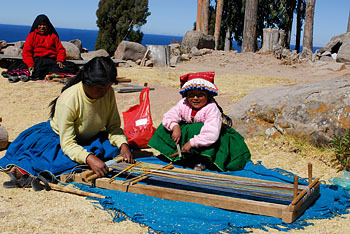 A young local girl helps to weave fabric. 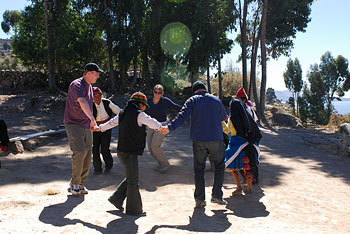 We also joined in with some traditional dancing! 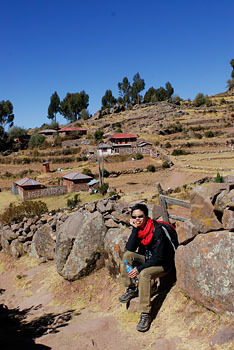 We walked over to the other side of the island and took the boat back to Puno. After getting back to the hotel we spent another hour in the spa. 24th July. 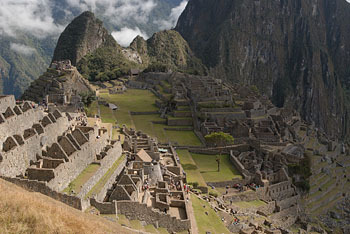 Another early start and another flight – from Juliaco to Cusco. 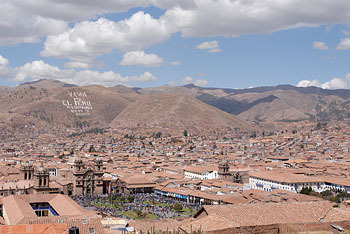 After checking into the Libertador Hotel in Cusco we walked into the town for lunch. During the afternoon we had a guided tour of the town, although this almost didn't happen! While waiting in the lobby a guide approached us and quoted the name "Nguyen" so we followed him out of the hotel... 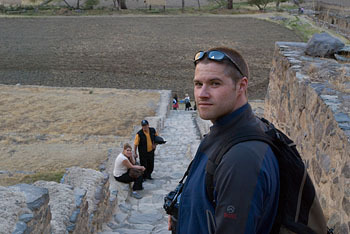 While crossing the road the guide told Jason that he was only expecting 2 people. 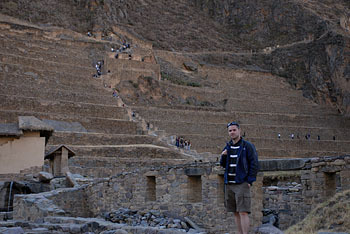 When we queried the guide it turned out that he was waiting for someone else. 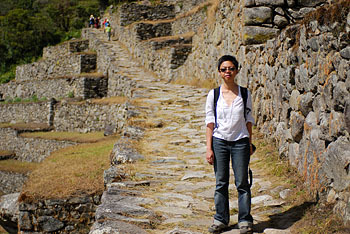 Our guide then turned up 30 minutes late. 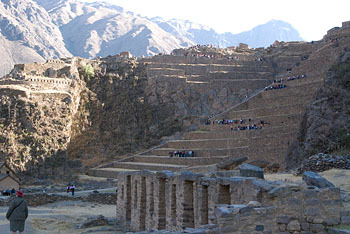 During our tour we visited: Qoricancha (The Temple of the Sun) which was opposite our hotel; La Catedral de Cusco; the ruins of Saqsaywaman and the ruins of Q'enqo. 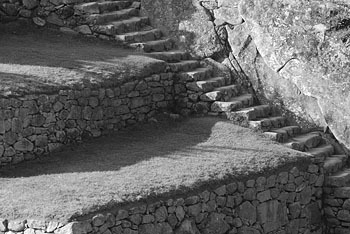 The Qoricancha was mainly destroyed by the Spanish however parts of the original rooms dedicated to the moon, stars and rainbow still remain. 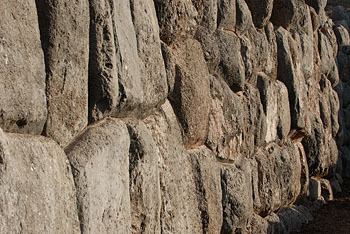 We were able to see how the Incas constructed their walls using keys between each stone to give extra strength. 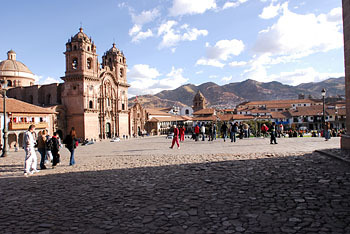 La Catedral de Cusco is the focal point of Plaza De Armas. 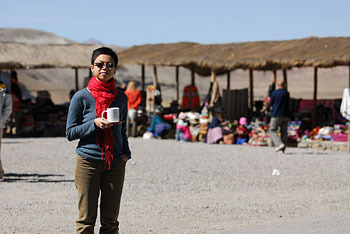 It contains many paintings of both local and European artists. The differences between the artists were highlighted by our guide (the local artists included depictions of their own gods such as the mountains, moon & snake. The painting of the last supper also showed a roasted guinea pig at the centre of the table). 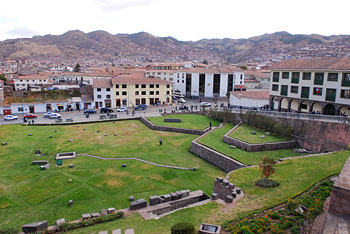 Cusco was built in such a way to resemble a puma. 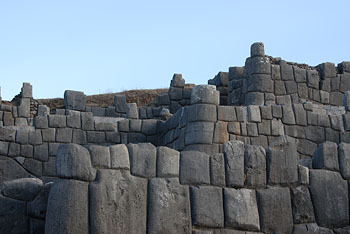 The ruins of Saqsaywaman formed the head of the puma, with the zigzag walls of Saqsaywaman constituting the teeth. 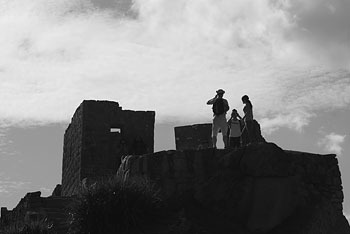 It was where members of the nobility lived. 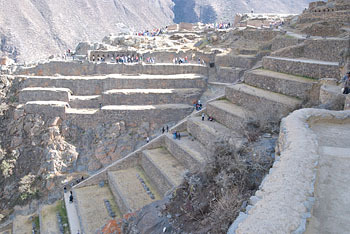 Around 2000 people lived here. 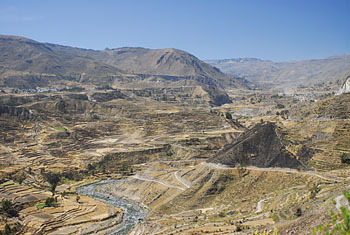 The site was arranged over 3 levels, depicting the 3 Incan worlds: the sky world (condor); this world (puma) & the underworld (snake). 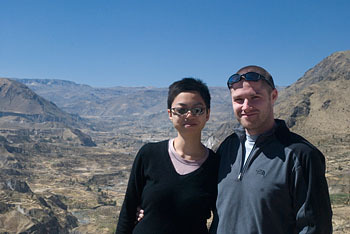 Tammay and I at Saqsaywaman with a view of Cusco in the background. 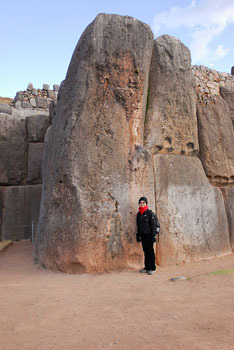 Tammay at the ruins of Saqsaywaman. 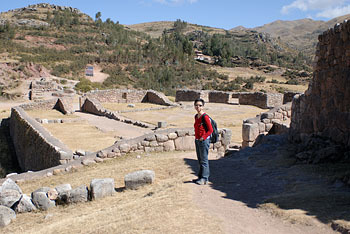 We also visited the ruins of Q'enqo which was the location where members of the nobility were taken when they died. 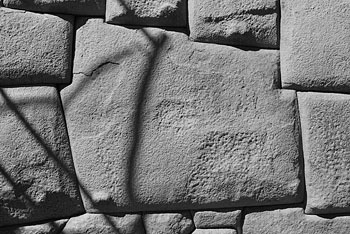 Their bodies were embalmed, wrapped in cloth and placed in the foetal position, they were then placed in individual alcoves along a curved wall, facing a central statue. 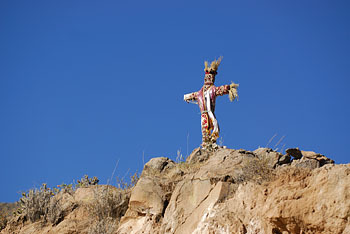 The statue was destroyed by the Spanish so it is not possible to tell what it depicted. 25th July. 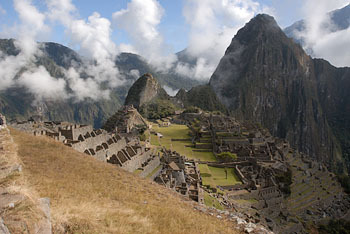 A free day to have a lie in and explore Cusco ourselves. 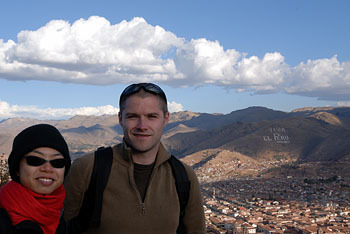 During the morning we walked around the San Blas district which gave us a nice view over Cusco. 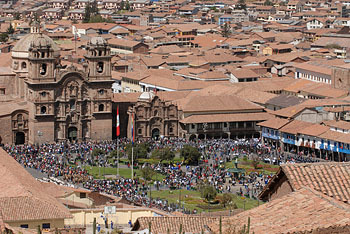 We were able to see bands from the local schools parade in the main square. 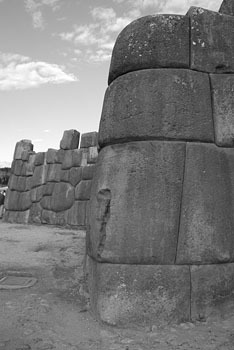 The Stone of 12 Angles is part of the walls of Inca Roca�s temple. 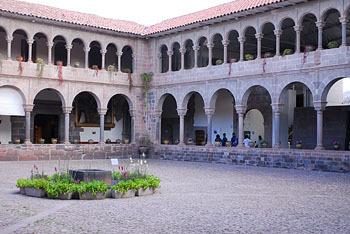 After lunch we visited the Inca Museum and the Museo Historico Regional. 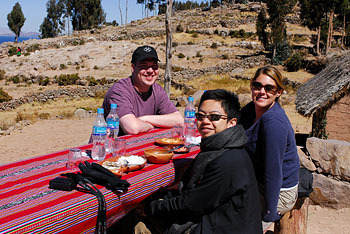 While we were staying in Puno we received a recommendation for the Inka House Pizzeria from an American lady. We ordered pizza, pesto pasta & guinea pig. They brought out two guinea pigs, the pesto was full of mint and the pizza base was basically a slice of dry bread. They also got our bill wrong twice... Do not go there! 26th July. 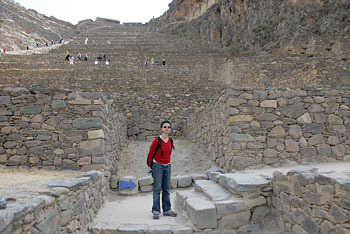 We left Cusco and headed for Ollantaytambo. 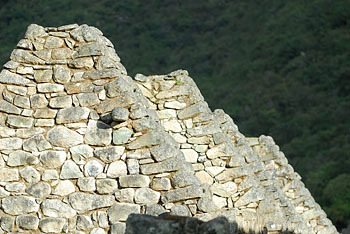 We stopped at the ruins of Puca Pucara. 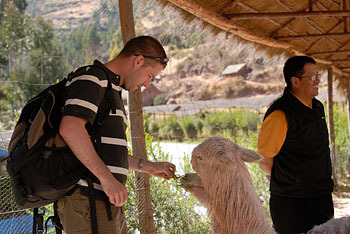 We also stopped at Awana Kancha, a small holding that reared llama / vicu�a / alpaca (although I'm sure it was more of a tourist attraction than anything else). 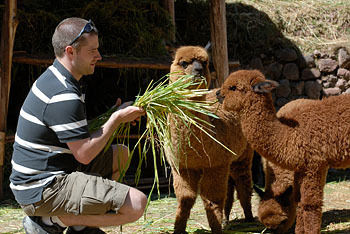 Here I'm feeding two "Alpacas Suri". 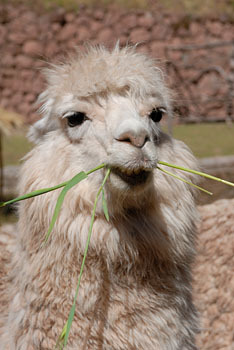 Two baby "Alpacas Huacaya". Their fur was so soft! 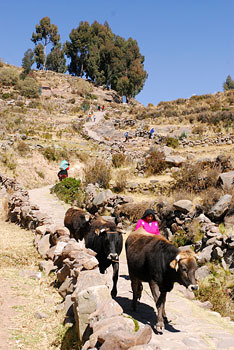 Our next stop was Pisac Market. We spent an hour looking around the stalls, but no statues or cuff-links for me! Lunch at a restaurant serving sweet and sour chicken that was dry enough to be two day old pork! We thought to write "chicken was a little porky" on the comment card but Jason was not sure how to translate exactly! 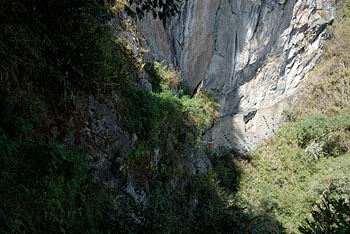 And you thought your journey to work was bad! 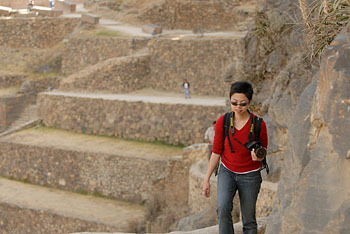 We spent a couple of hours in the afternoon walking around the ruins at Ollantaytambo. 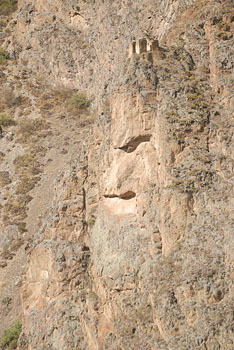 This face had been carved into the mountain side – it is just about visible in the photo above. 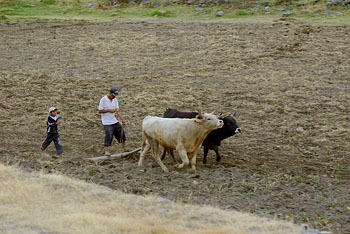 I watched as a local ploughed a field. Back to a lovely room at the Sol hotel. 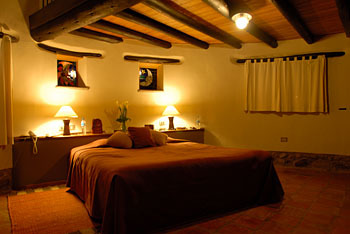 Our room at the Sol y Luna. 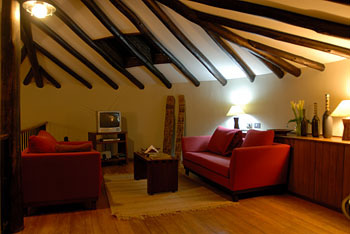 Our little "bungalow" had an upstairs with a small loune. We ordered room service and watched Ocean's 12. 27th July. 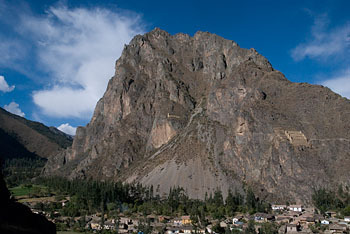 The day started off very badly... A driver was supposed to ferry us from the hotel to the train station in Ollantaytambo. But by 06:10 nobody had turned up. 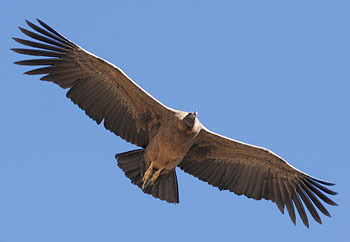 The receptionist called the travel operator and the simple reply that came back was "no one is coming for you". We called a local taxi driver and offered him double the standard fare if he could get us to the station in time. 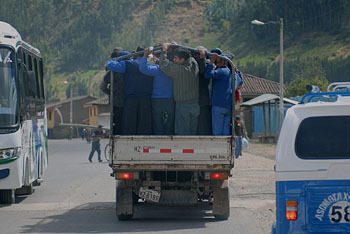 If we had been scared by Peruvian driving in the past this would set a new standard. At one point we were overtaking a VW Beetle at about 60mph when the Beetle pulled over into our lane to avoid a hole in the road. Our car was forced onto the verge. Missing the two chickens was not a top priority but the driver seemed to manage it as he pulled on the handbrake! After getting to the station I still had to run down the road to the platform carrying a large suitcase before I knew we had made it in time. 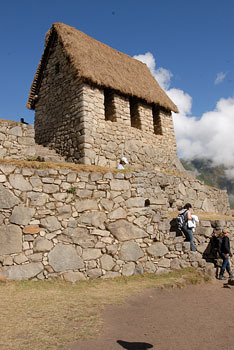 We took the "vistadome" train from Ollantaytambo to Machu Picchu Pueblo. 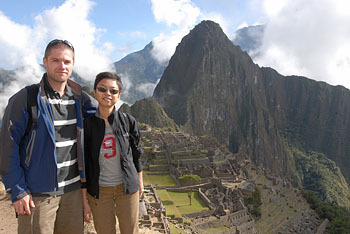 We took the 30 minute bus ride from Machu Picchu Pueblo to the top of Machu Picchu. 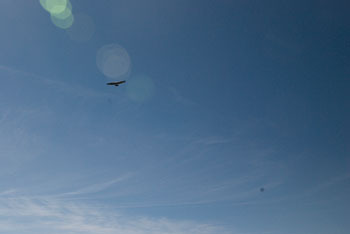 Our guide took us around the main site before a lunch at the Sanctuary Lodge. 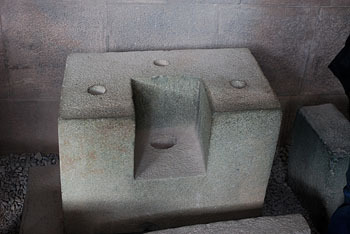 The Inca's would cut small holes in larger rocks and fill them with water. If the temperature then fell below freezing the water would turn to ice – expanding and split the rock cleanly. 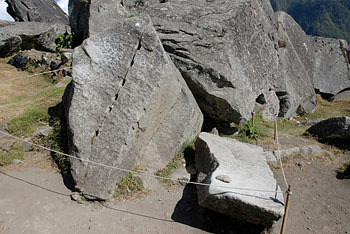 This rock had been carved to resemble the various peaks around Machu Picchu. 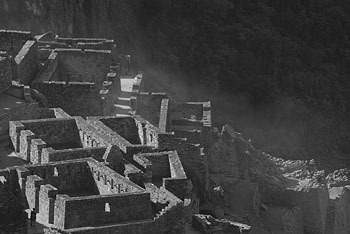 After lunch our guide took us to the Inca Bridge – part of an old Incan trail that has now been closed due to a dangerous state of repair. 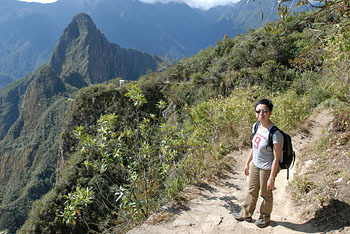 The path was very narrow with a steep drop to the valley below. 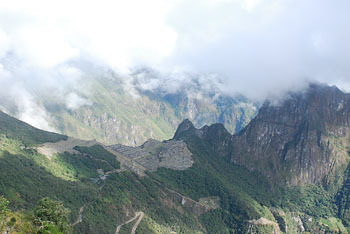 We walked as far as we could and got this view of the Inca Bridge – a narrow walkway across a gap in the rock. 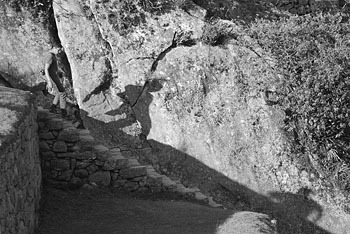 You could just about see the old continuing on around the mountain – marked by a thin line of vegitation. Tammay and I walked back to the main site and walked around once again, making the most of the nice light from the setting sun. 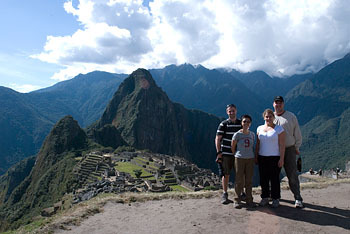 Myself, Tammay, Kelly & Jason at Machu Picchu. 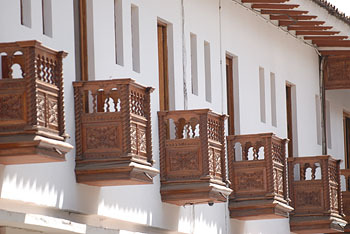 We decended into the main town and checked into Inkaterra and ate dinner. 28th July. 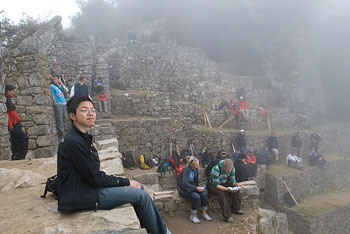 We got up early so as to catch the first bus to Machu Picchu. The first bus left at 05:30 and even though we got there on time we only made it onto the 20th bus. 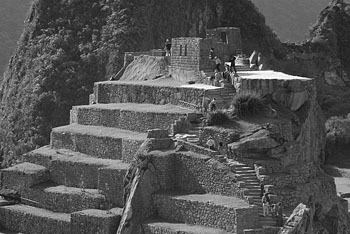 We passed the Watchman's Tower and made our way to The Sungate, passing many of the hikers coming into Machu Picchu at the end of the Inca Trail. 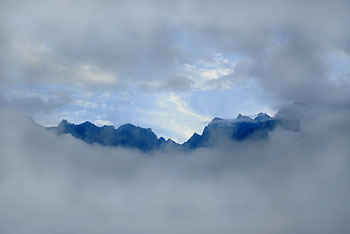 As we made our way along the path a small opening appeared in the otherwise total blanket of cloud and we were able to see the peaks of some of the surrounding mountains. The view disappeared just as quickly as it had appeared. 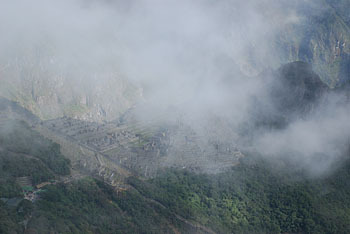 We wanted to get to the Sungate for Sunrise however it was still covered in cloud when we got to the top. 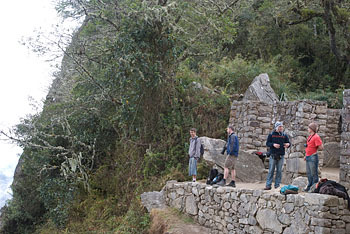 We talked to two English guys at the top, one of which had started out at 04:30 and hiked all the way from the bottom. After waiting for about two hours the cloud finally started to lift. 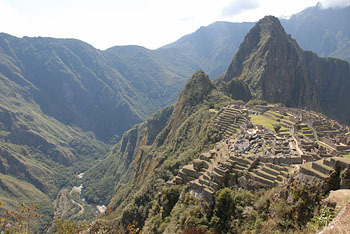 We finally started to get clear views of Machu Picchu. 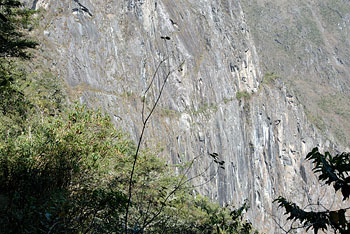 Jason & Kelly hiked to the top of Huayna Picchu which can be seen on the far right of this photo, still covered in cloud. We made our way back down the path to the main site. 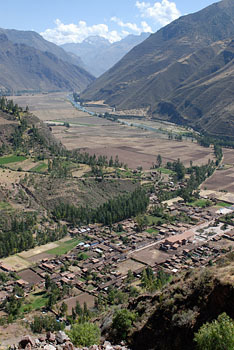 We took the opportunity to have one last view of the main site and took the bus back down to the town for lunch at Inkaterra. 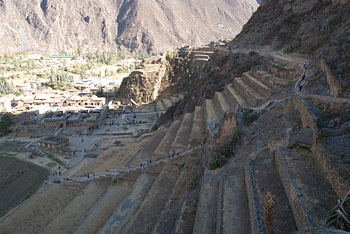 We walked back to the train station and although there was a nervous wait for our bags we were soon back on the Vistadome to Ollantaytambo. 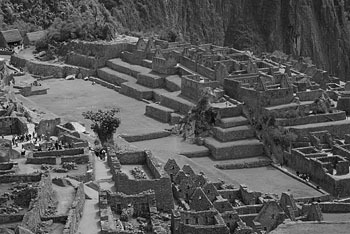 Our transfer on to Cusco came in the form of a 30 seat coach all to ourselves... we just about managed! We checked back into the Libertador and had dinner in the hotel cafe – the best club sandwich I've had in a very long time. 29th July. 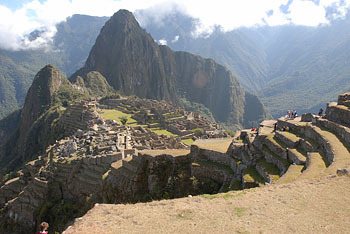 We transferred to Cusco airport and flew to Puerto Maldonado. 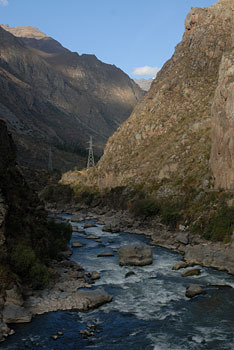 We transferred to the river in a converted old bus with wooden bench seats. 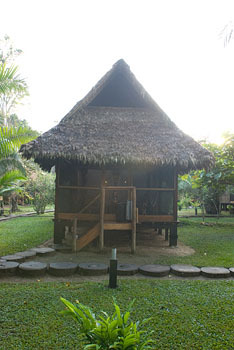 A boat ride down the Madre de Dios River took us to the Inkaterra resort. 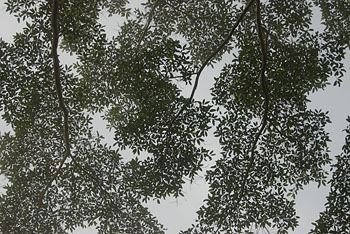 We were given an introduction to the rainforest by our guide. 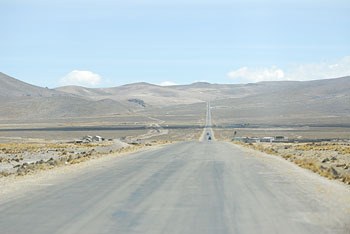 We were now only about 5 miles from the Bolivian border. 30th July. 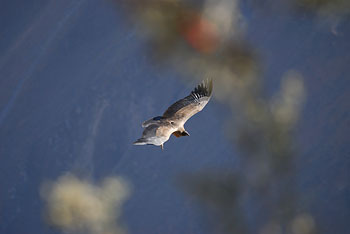 The first half of the day was taken up with a trip to Lake Sandoval. 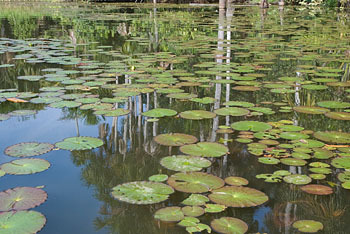 We hiked around and kayaked on the lake, spotting black cayman, bats, turtles, a baby sloth & many birds. We were going to do the night tour but the thunder and lightening started and down came the rain. 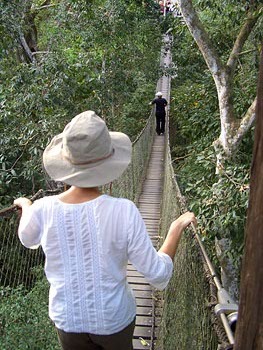 In the afternoon we went on the Canopy Walk. 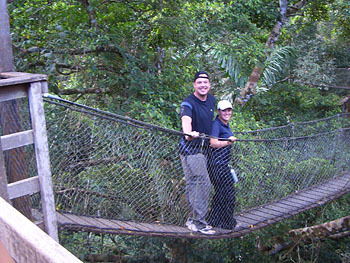 We ascended high up into the treetops with these huge wooden towers and rope bridges. 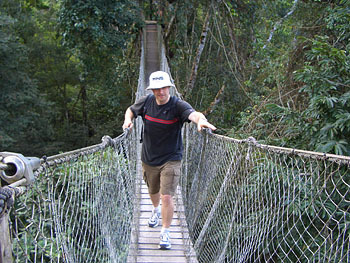 We crossed the long bridges, holding on for dear life as they bounced up and down! 31st July. 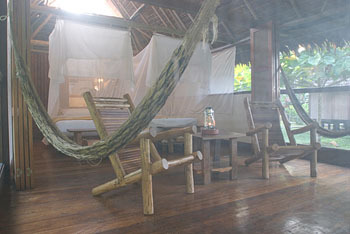 During the night the temperature dropped and I had reached our under the mosquito net to grab a blanket. 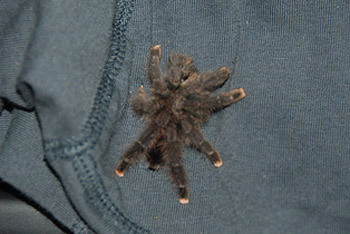 As we moved around the room the next morning I spotted a male tarantula resting on a t-shirt that had been right next to that blanket... I was very glad not to have woken up with it on my face! 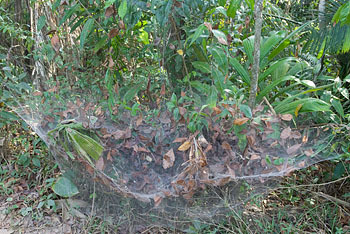 When we spoke to the guide he casually informed us there was a tarantula nest behind our challet. 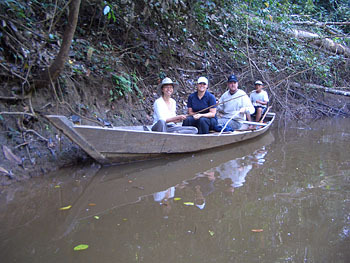 We left the resort and took a boat down the Madre de Dios to Gamitana Creek. After breakfast we took an all day tour around Gamitana Creek. We hiked through the rain forest, trying a fresh lemon and starfruit, and reached a point in the creek where we picked up our two kayaks. On the way downstream we tried our hand at fishing. Despite a lot of interest from the minnows none of us landed a piranha. As we rowed down the creek, Tammay, Jason & Kelly's kayak came a little too close to this cayman! 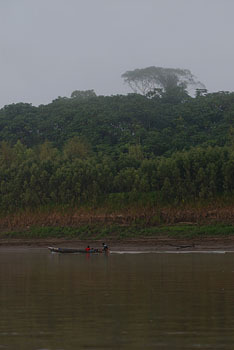 We managed perfect timing with the rain – as we ate lunch & during the boat trip back to the lodge it rained heavily. 1st August. We start the long hard journey home. 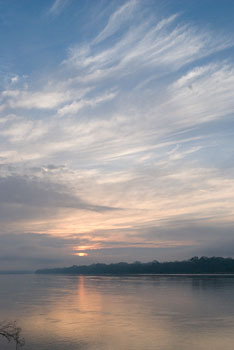 A morning boat ride from our resort back to Puerto Maldonado for our flight to Lima (via Cusco). Before getting the flight we walked around the butterfly enclosure. At the airport we passed a little time counting my 40 odd insect bites. 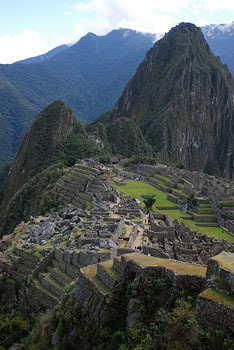 Once in Lima we had a further 9 hour wait, but decided against going into town. 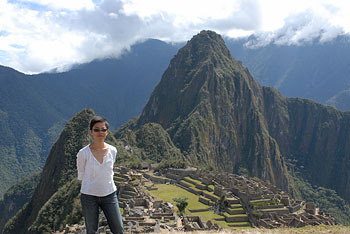 We met a Lima Tours rep who wanted feedback on our trip – Jason and I ended up stuck in the lift with her – the outer doors of the lift refused to open and when tried to prize them open she started to freak out a little. 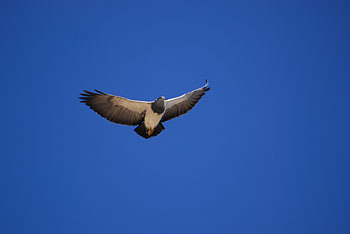 There was a sharp jolt downwards before we were returned to the ground floor! At the airport we split our time between MacDonalds, Papa Johns & Starbucks. We managed to make a perfect guess at where the queue for the check-in would start and were the first in line... Little things! The flight was delayed an hour but our connection in New York was also held for an hour. We managed to get home late on Saturday.